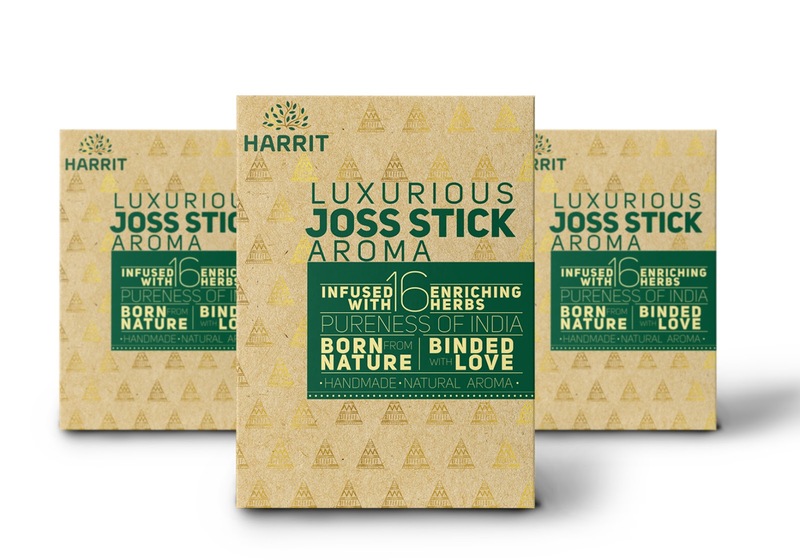 Luxurious Joss stick are aroma stick made from the by-products of Indigenous breed of cow, Gir cow. It is completely natural without any use of toxins and completely handmade. 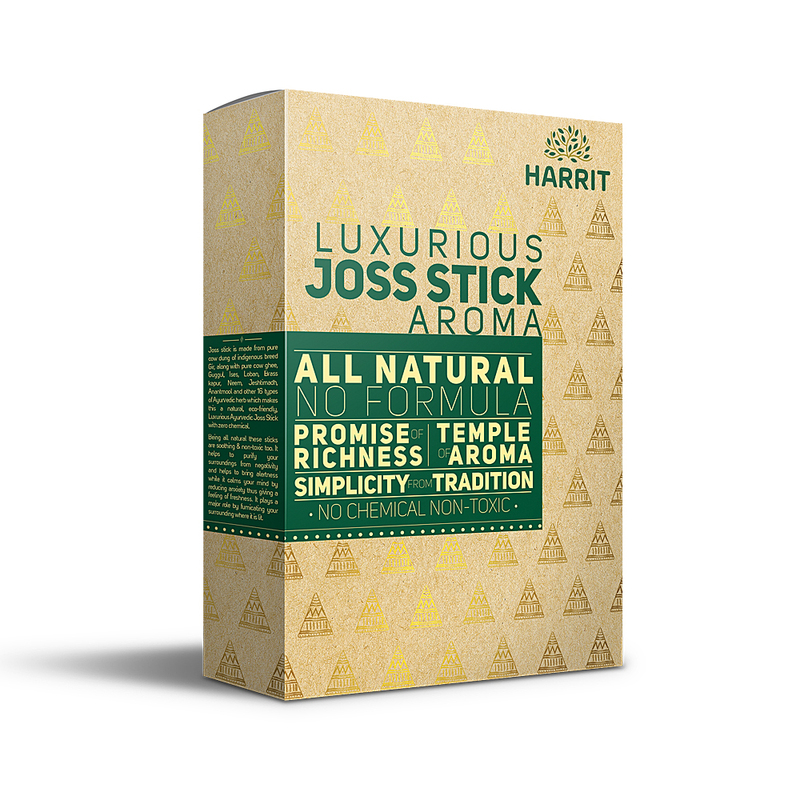 These Joss sticks are made with the use of 16 Ayurvedic herbs that are from captured from nature. The soul of an Ayurvedic brand lies in its simplicity and creativity that could convey purity. Communicating all elements of the brand is what a packaging needs to be best at. 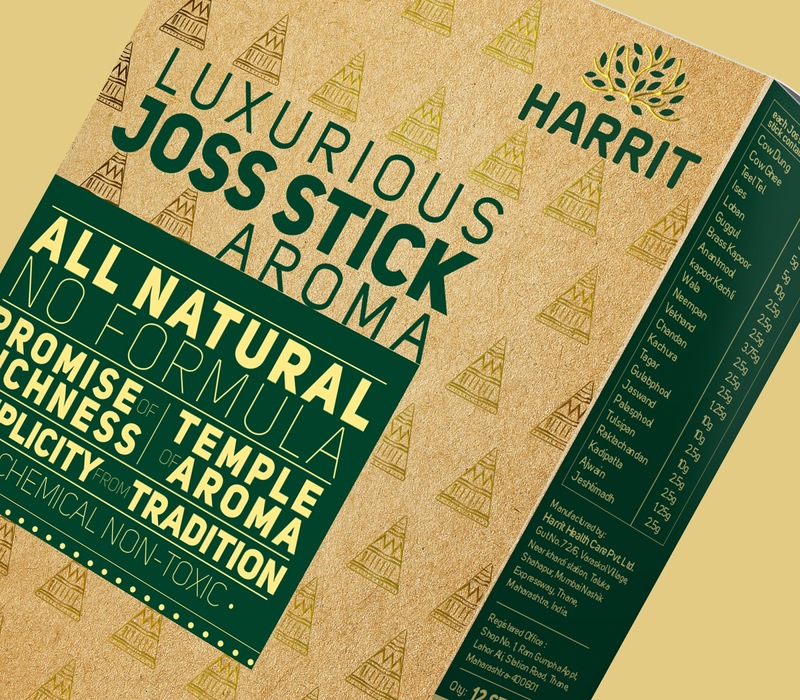 This packaging design for Harrit health care joss sticks spells wellness and harmony – a promise of an authentic organic Ayurvedic brand. 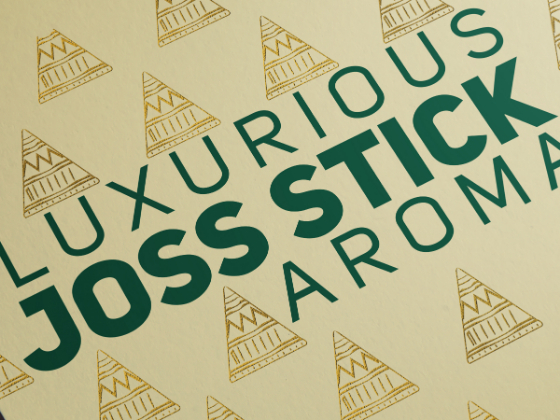 We transformed such memorable & healthy aroma into a stamp, which reflects products’ characteristics perfectly. 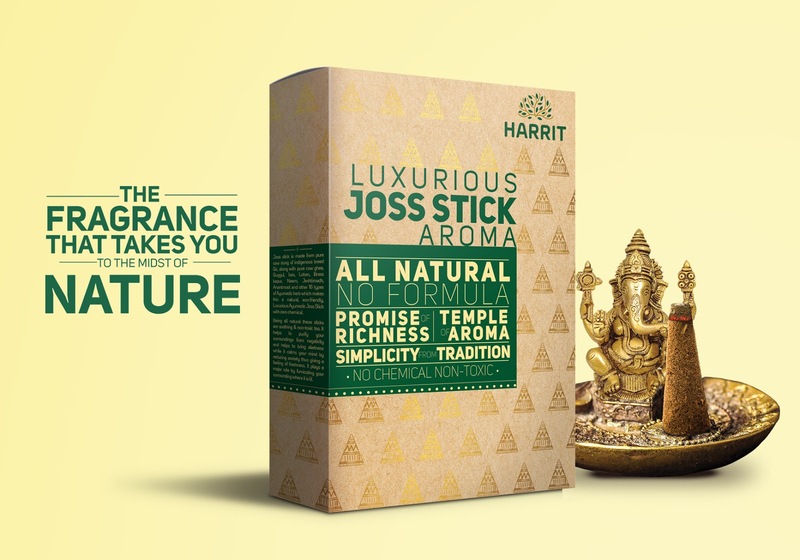 The golden triangles subtly in the background depicts the shape of the joss sticks and also the feature- i.e A temple of aroma. We realised on the way that developing a packaging concept for the right target audience needs simplicity. We wanted to truly represent the brand’s core: Ayurvedic, wellness and their usage of organic, natural ingredients. We achieved that by having a colour palette that symbolises that exactly. We wanted a practical, functional quality that incorporates everyday wellness, as well as has a communication of the ingredients. We strove for a fresh approach that helps to communicate an easiness and effortlessness, but also has a hint of a sophisticated understatement. While we craft a packaging design we always believe in adding an experience for the users. An experience where the product is perceived from the outer look and it communicates the promise it comes with. We decided to print these box on board with a craft look printed because it communicates the special, rough look & which works well in combination with the nature inspired products. 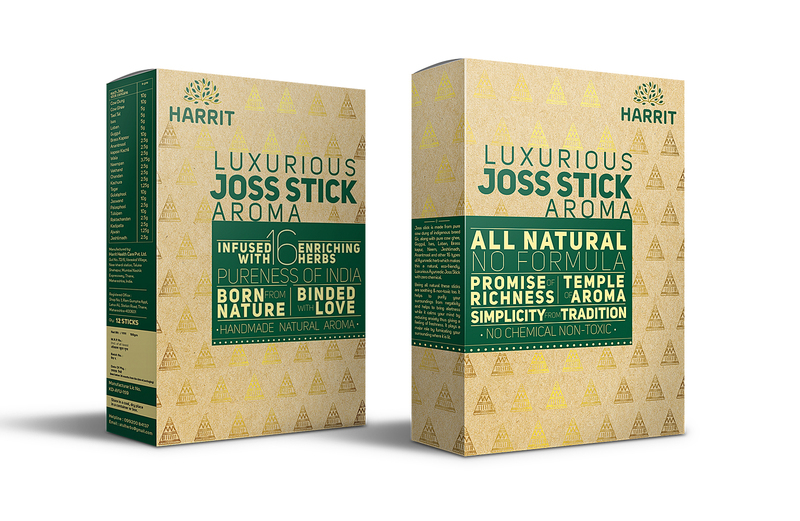 For Harrit Joss stick, the perception of it being all organic, natural, Ayurvedic and aromatic was the key communication which required us to be clear while someone looks at the pack.